Nature has been the artists muse for centuries. The twenty photographs in this exhibition magnify forms, textures, and colors of fossils ordinarily invisible to the naked eye. Physician and archaeologist Giraud Foster and biomedical/scientific photographer Norman Barker collaborated for twelve years, merging art and science into an innovative, high-magnification photographic technique, to produce boldly colored images. They select fossil specimens that are particularly striking in at least one field of vision under high magnification. At the same time, they seek to reveal dynamic compositions of color and varied texture. This exhibition was organized by the McMullen Museum of Art with text by faculty of the Boston College Geology and Geophysics Department: Paul Strother, David Krauss, and Ken Galli. The photographs are a recent gift to the Museum from Giraud Foster and Norman Barker. 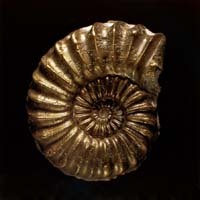 To learn more about fossils, click here.